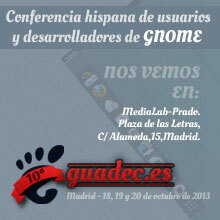 Este fin de semana celebramos en Madrid la décima edición de GUADEC-ES, la version hispana de la conferencia europea para desarrolladores y usuarios de GNOME. Si quieres asistir, sólo tienes que registrarte y pasarte el Viernes 18, Sábado 19 y Domingo 20 de Octubre por las estupendas instalaciones de MediaLab-Prado. So, starting on April 1st (not a fools’ day joke! ), I’m now employed by Lanedo GmbH, and full-time working on the Gnome Tracker project, mainly involved in FTS and the filesystem miner. It was great to work with everyone in Azetti Networks. Keep Jardin and Waterfall alive! I also hacked a new feature for Gnome Devhelp, the possibility of enabling or disabling specific books, which was integrated into git master last week, and will make it for the 3.0 release. Oh, and I’ll be attending both the GHM and GUADEC in The Hague!